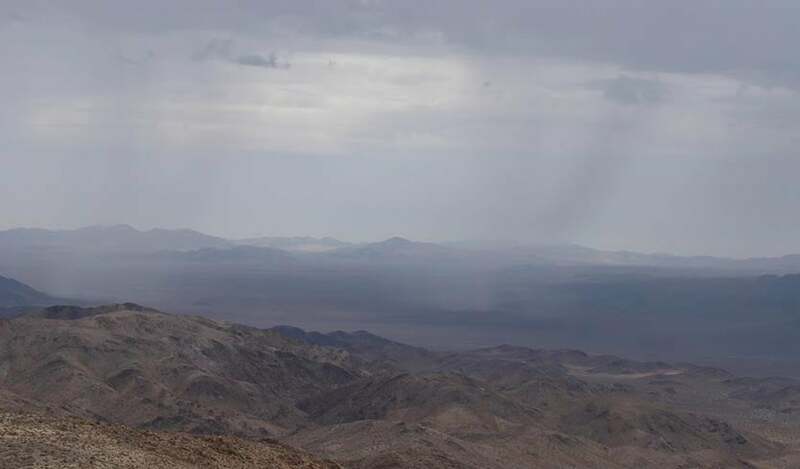 Above: Summer rain showers fall over the desert region about 40 miles northeast of Imperial, California, as seen from Belle Mountain in Joshua Tree National Park, at 12:15 pm PDT July 19, 2017, when the temperature was 100°F (38°C). Image credit: National Park Service. Update: Paul Iniguez of the Phoenix National Weather Service office has done more detailed analysis on the July 24, 2018 rain event at Imperial, and has concluded: "Did quite a bit of analysis on this. Based on all the data (radar, satellite, soundings, area obs), this looks like an error with the present wx sensor. I really don't think this is a new record." The present weather sensor is what measures the presence of rain, when only a trace of rain is reported, and it is possible for this sensor to get fooled. In particular, there was not significant cloud cover apparent on satellite imagery during the first hour that rain was reported at Imperial, though clouds did move in after that. In light of Paul's analysis, we have to regard the world-record hottest rainfall event at Imperial, California as questionable. July 24, 2018 was one of the hottest days in California history, as a searing heat wave of rare intensity, even for the Desert Southwest, sent temperatures soaring to near-record levels. Death Valley hit 127°F, just 2° short of tying the all-time world record for hottest reliably recorded temperature; Palm Springs hit 122°F, just 1° short of tying its all-time record; and Imperial, California topped out at 121°F, their hottest day since 124°F was measured on July 28, 1995. The temperature might have gone higher on July 24 in Imperial, but clouds streaming in from the Gulf of California brought mostly cloudy skies by mid-afternoon, and rain showers began falling at 3:53 pm PDT. At the time the rain began, the temperature was an astonishingly high 119°F (48.3°C)—a new world record for the hottest temperature ever measured while rain was falling. A series of rain showers continued to affect Imperial in the late afternoon and early evening, with the station recording light rain for four consecutive hours. Most of the rain evaporated since the humidity was only 11 - 15% during the rain event, and only a trace of precipitation was recorded in the rain gauge. Nevertheless, the July 24 rain at 119°F in Imperial sets a new record for the hottest rain in world history. I called around to some of the businesses and city offices in Imperial to find someone who could tell me what rain at 119°F felt like, but most of the people I talked to were too busy hurrying from one air conditioned place to another at the time to notice the event. One person did report that going outside after work while the rain was falling made it difficult to breathe, and felt hard on their heart. I gave them my sympathy for suffering through this truly rare and uncomfortable event! Check out the visible satellite showing storms blowing up over Gila County...and very little further west. #azwx Thanks, @CollegeDuPage for the great weather tools! It is rare to get rain when the temperature rises above 100°F (38°C), since heat of that intensity is usually accompanied by a high pressure system with sinking air, which discourages clouds and rainfall. In addition, when a shower or thunderstorm does bring rain, the cold outflow from the approaching cell typically cools the air before rain starts falling. 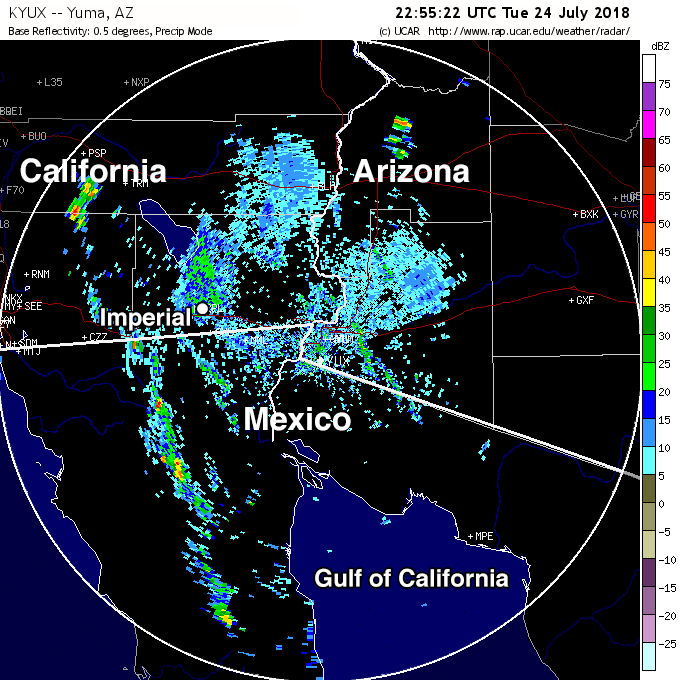 The July 24, 2018 rain in Imperial was due to a flow of moisture coming from the southeast caused by the Southwest U.S. monsoon, a seasonal influx of moisture due to the difference in temperature between the hot desert and the cooler ocean areas surrounding Mexico to the south. The air on that day was flowing from the Gulf of California, where water temperatures were a bathwater-like 88°F (31°C), about 5°F (3°C) above average. Evaporation from this hot water provided more moisture than is usually available to the atmosphere over the Desert Southwest. You can see a continuous stream of clouds affecting the Imperial region during the late afternoon and early evening hours of July 24 (lower left side of the animation from a tweet from NWS Phoenix, embedded above). These cells were not intense enough to generate a cooling outflow of air like a thunderstorm would. The previous record for the world’s hottest rain occurred on August 13, 2012, in Needles, California, when rain fell at 115°F with a humidity of 11%. According to weather records researcher Maximiliano Herrera, the 11% humidity that accompanied the rain shower at 115°F in Needles was the lowest humidity at which rain has ever occurred anywhere on Earth in recorded history. 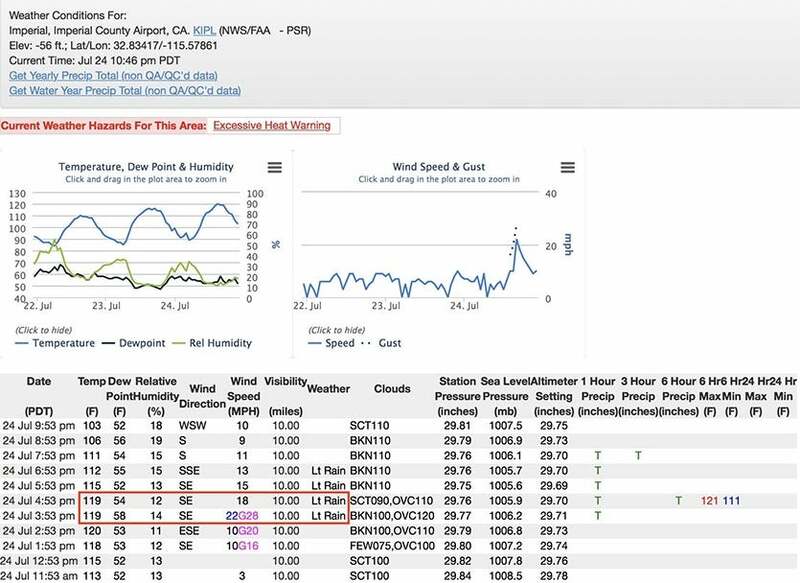 Prior to the 2012 rain event in Needles, the record for hottest rain, which I blogged about in June 2012, was a rain shower at 109°F (43°C) observed in Mecca, Saudi Arabia on June 5, 2012 and in Marrakech, Morocco on July 10, 2010. Bob Henson contributed to this post. Countdown to World War 3? Has Putin headed up a coup?